The Economic Regulation of Broadcasting Markets: Evolving Technology and Challenges for Policy, Cambridge University Press, 2007. New technology is revolutionizing broadcasting markets. As the cost of bandwidth processing and delivery fall, information-intensive services that once bore little economic relationship to each other are now increasingly related as substitutes or complements. Television, newspapers, telecoms and the internet compete ever more fiercely for audience attention. At the same time, digital encoding makes it possible to charge prices for content that had previously been broadcast for free. This is creating new markets where none existed before. How should public policy respond? Will competition lead to better services, higher quality and more consumer choice – or to a proliferation of low-quality channels? Will it lead to dominance of the market by a few powerful media conglomerates? 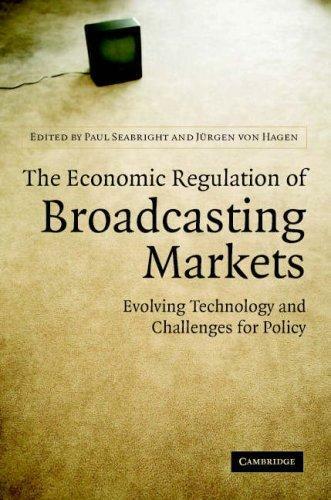 Using the insights of modern microeconomics, this book provides a state-of-the-art analysis of these and other issues by investigating the power of regulation to shape and control broadcasting markets.